There have been many recent developments in the research, theory, and practice of supervision in counseling, but few reliable resources are available for practitioners seeking to expand their knowledge in these areas. 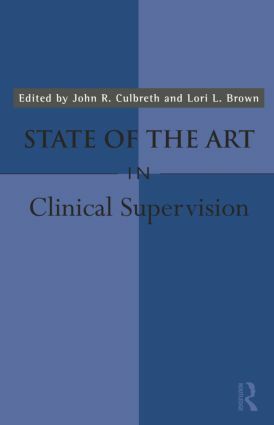 Culbreth and Brown have assembled a group of leading researchers, scholars, and professionals in the field to present a collection of chapters on the state of the art in clinical supervision. These chapters provide the reader with fresh approaches to core topics, such as multicultural competence, religion and spirituality, and the training of supervisors, as well as discussions of new areas of study. Alternative methods to conducting supervision are explored with expressive art techniques and the uses of narrative therapy and concepts of emotional intelligence. Triadic supervision and the use of the newest developments in technology are also considered. Current and future supervisors will no doubt find the innovative and informative strategies described in this book invaluable in their work with supervisees.